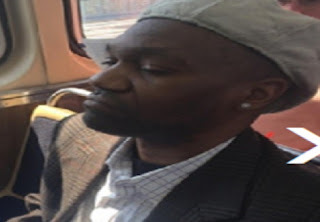 Chicago police on Thursday afternoon issued a community alert that seeks information about a man who is wanted for inappropriately touching himself in front of a female Brown Line passenger last month. The alert is the second police alert about obscene behavior by men on the Brown Line since mid-May. 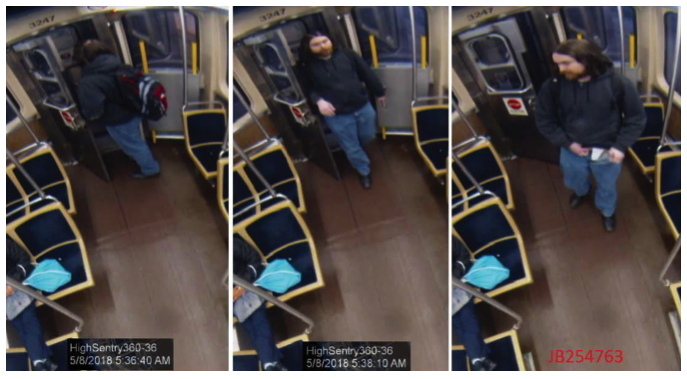 Around 5:30 a.m. on May 8, the man shown above reportedly stood across from a woman on a Brown Line train as it approached the Francisco station. The man moved through a number of train cars before he stopped next to the victim and “inappropriately touched himself,” today’s alert said. He then exited at the Francisco stop. The suspect in today’s alert is described as white, 25- to 35-years-old with shoulder-length brown hair and a full beard. He was carrying a black backpack and wore a navy blue hoodie with blue jeans and black shoes, police said. Anyone with information about the man seen above is asked to call Area North detectives at (312) 744-8261. On May 17, police warned about a different man who had been reported twice for indecent behavior on the Brown Line. One of those incidents also occurred on May 8th, but later in the day, according to police. Both of this offender’s victims were pregnant. 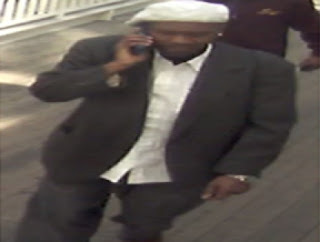 The first case involving the previous suspect was reported around 3:15 p.m. on May 8th by a woman who said the incident occurred while riding near the Montrose station. Two days later at about the same time of day, another woman reported similar behavior as the train moved near Southport.